What do you like to eat for breakfast? Porridge? Toast? Cereal? Mmmm, breakfast is a very tasty time of day! It's important to have breakfast in the morning to give you energy for the rest of the day. This breakfast table is looking a bit pale though, can you colour in the picture of the healthy breakfast? 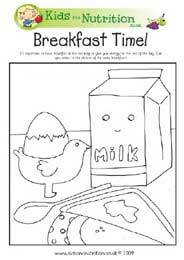 Why not Download the Healthy Breakfast Colouring Sheet and see how bright you can make this picture. This activity is aimed at 3 to 7 year olds, it's a fun way to raise your child's interest in healthy eating, as well as building their problem solving skills.